Elder Torrez (our area authority) recently taught us, “Become a true follower of Christ. What will you do about this invitation? The tender mercies of Jesus Christ are to make us mighty. Even unto deliverance.” Elder Torrez continued, “The Lord meets us no matter where we are.” I agree with him because I have found it true in my life. The Lord knows me and tutors and cares for me in the unique way that only I need and can understand. I have a question for you. Who do you live for? – Many fellow Christians believe as we do that being saved is only the beginning. Alma 5: 9-14. CHANGED FROM WHAT, TO WHAT? – Alma 5:17 – to righteous works. Christ’s work. – We call this dedication, CONSECRATION. Consecration means dedicating yourself to God’s purposes. Who do you live for? If you have been baptized, you have promised Heavenly Father to live for Him and Jesus Christ. – Mosiah 18: 16-18. What do you promise, what is promised to you? We consecrate ourselves to Christ when we are baptized. True conversion is referred to as being born again. How is Christ like a father to us? Are you keeping your baptismal promises? What will help me keep my consecration? – reminds me of this promise I made? – allows me to renew my commitment to take His name upone me – to be His true follower? – washes my mistakes away? Mistakes I made because I forgot for a moment that I promised to give my life to Christ, Mistakes I made because I felt selfish or afraid or untrusting of God? The sacrament is a gift to each of us if taken worthily and sincerely and helps us keep our baptismal covenant. 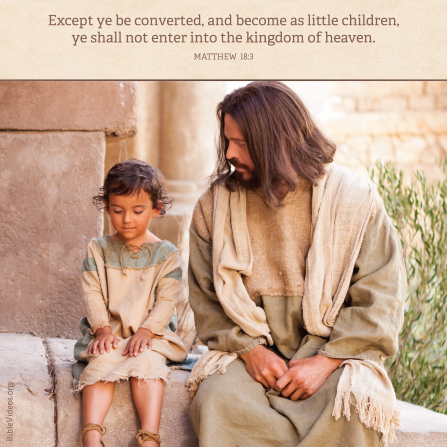 – My babies didn’t take the sacrament until they could recognize a picture of Jesus Christ. – My little kids couldn’t color, read or such until after the sacrament. – We do important things with our right hands (oath, pledge, shake on a deal, tell the truth in a court). Practice at home. How can I use the sacrament to increase my consecration? – We will have His spirit to be with us. – strength. The Atonement of Jesus Christ is not just for when we sin, it makes me more. It makes me more than I am alone. The sacrament increases my ability to do His work. I invite you to improve your consecration that happened at your baptism through careful reverent partaking of the sacrament. In doing so I have increased my ability to help Jesus Christ in His marvelous work. I testify that Jesus Christ lives. I know this not because I have seen him with my own eyes, but because I have seen unmistakable evidence of His living, current, tangible influence in my life and in His Church. He has guided me to know what to do and say. He has comforted me in times of trial. He has strengthened me in times of temptation. I feel Him near me – at times – when I am reading the scriptures and especially when I am pleading on my knees – not always, but enough times. I refuse to forget these spiritual moments. They are foundational to my testimony and continue to fortify it. Though I haven’t seen Jesus Christ here on earth, I know others have. I trust that these prophets speak the words of the Lord and I follow their every word to the best of my ability. I sustain President Nelson as our new president of The Church and prophet of the world. I love him. I feel his love for me as I listen to him speak. I sustain Bishop Hilton and his counselors as our new bishopric. I know Heavenly Father and I know Jesus Christ, His only begotten Son. I have spoken to them. I have studied Jesus Christ’s life and their doctrine. They have spoken to me through my thoughts and other forms of personal revelation. I am grateful Jesus instituted the sacrament to help support me in my consecrated path to serve him always.